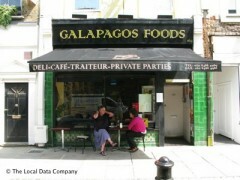 I very much enjoy turning off The Battersea Park Road to have lunch or dinner at Galapagos Foods. For such a tiny restaurant they have a surprisingly good chef and it's small enough for the staff there to greet customers by name when then come in. I am always impressed by the service and there is always more than one vegetarian option on the menu. Laid back and friendly (feels like a cafe - at lunchtime) and quiet and intimate in the evenings - a good local find if you are dining with someone and actually want to be able to enjoy conversation with them without having to shout or strain to hear what is being said to you. It's also very reasonably priced. A good little hideaway for Battersea types. I have been coming to this brilliant little place for around 6 yrs and despite having moved to North London, still travel across town to Battersea for the outstanding and consistently interesting food, great service and lovely atmosphere owners, Elaine and Steeve, have created. They are friendly, sincere and expert at anticipating needs without over-serving. It's a local gem that sometimes needs a booking but generally has a table available, depending upon which evening you go. You can expect a good variety of home cooked Latin American, Asian and Mediterranean fare, which is always fresh and nicely presented. The Burmese tomato salad, spicy prawns and cheesecake are my standout dishes. I always leave feeling happy, content and cheery after a good feed up in great company. One for a cosy date or just a mellow and easy night out with mates. Highly recommended!